a local tree farm, Fragrant Firs. Christmas is such a special time of the year and for many families, the selection of a Christmas tree is a “deep-rooted” Christmas tradition that often marks the beginning of the holiday season. 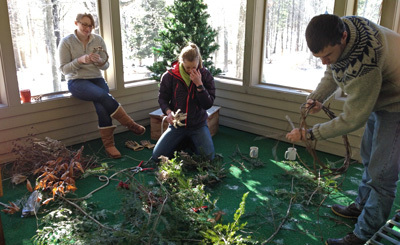 Searching for and finding the perfect tree is always a lot of fun for “kids” of all ages. There are many different species of trees that are commonly used for Christmas trees. Pines, especially the long-needled white pine and the shorter needled Scotch pine, are very popular for Christmas trees especially here in the Shenandoah Valley. These make long-lasting Christmas trees but are sometimes hard to decorate because they tend to be very full, especially if they’ve been sheared heavily. The branches of white pine are quite flexible so then tend to bend under the weight of heavier ornaments; those need to be hung closer to the trunk. Scotch pine and Austrian pine don’t have this problem as they have much stiffer branches. Spruce trees make lovely Christmas trees, if you can get past their very prickly needles! 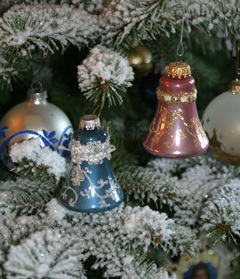 They have a wonderful shape with good strong branches for holding lots of ornaments. Andre’s snow tree sparkles in the light. Because of their strong branches and open growth habit, André usually picks a beautiful spruce for his “snow tree” which he flocks and decorates with colorful balls and other ornaments – no lights go on this tree. 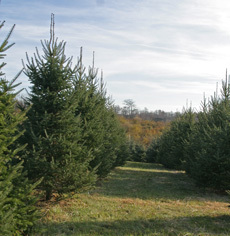 Norway spruce, blue spruce, and white spruce are commonly cut for Christmas trees. The spruces don’t hold their needles quite as well as the pines and firs but if you keep water in the tree stand, they will last a good while. Sometimes cedar trees are cut for Christmas trees but they can also be prickly and they dry out fairly quickly. My grampa had a little farm in northeastern Pennsylvania and he used to cut a small hemlock as a Christmas tree. These were pretty and the needles were very soft but they didn’t last long indoors and the branches were rather flimsy for holding heavier ornaments. A beautifully decorated fir tree. 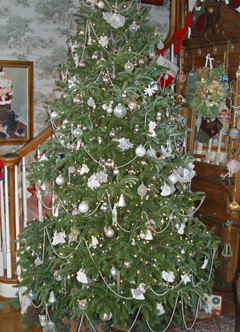 My personal favorite for a Christmas tree is one of the soft-needled fir trees. These trees are long-lasting with great needle retention and they add a wonderful fragrance to your home for the holidays! They have strong branches and, as long as they haven’t been over-sheared, are open enough to hang lots of ornaments. This is important because we have loads of ornaments. 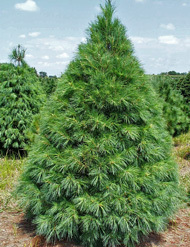 Fir trees have long been a favorite for cut Christmas trees particularly in the northern parts of the country because they are a typically a northern species. Balsam fir (Abies balsamea) grows in the cold climate of New England and Canada and noble fir (Abies procera) is found in the Pacific Northwest. Both of these species are cut and shipped all over the country for the Christmas tree trade. 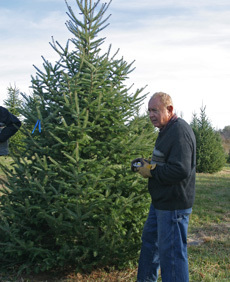 Two other firs, Fraser fir and Canaan fir, are popular Christmas trees in the Mid-Atlantic States. It’s really interesting how a northern tree species like fir came to grow as far south as North Carolina. Canaan fir and Fraser fir are believed to have evolved from relict populations of balsam fir that survived on the mountaintops after the last glacial period. During the Pleistocene glaciation, it is thought that many of the northern conifer species, including the balsam fir, migrated south along the Appalachian Mountain range until there was a continuous fir population from Canada south to North Carolina. 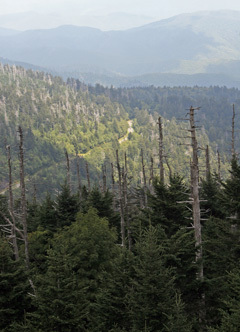 North Carolina near Clingman’s Dome. As the climate warmed, the balsam fir retreated back to the north and southern tree species replaced the fir trees at lower elevations in the south. However, isolated pockets of firs remained at higher elevations in the mountains of North Carolina, Virginia, and West Virginia. These firs, which are now considered varieties of balsam fir, are Fraser fir (Abies balsamea var. fraseri) found only in the mountains of North Carolina, eastern Tennessee, and Virginia above 3,800 feet, and Canaan Fir (Abies balsamea var. phanerolepis) which is restricted to higher elevations in the mountains of West Virginia and Virginia. Sadly, over the last 50 years about 95% of the mature Fraser firs in the southern spruce-fir forest have been killed by the balsam woolly adelgid (Adelges piceae). This pest initially decimated populations of balsam fir in the Northern Appalachians and has since moved south to the Smokies. 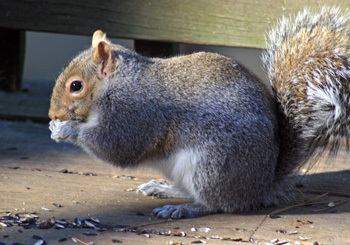 Read more about this devastating pest. Until next time – Merry Christmas and Happy Holidays to everyone! Winter is a quiet time in our garden except for the soft whisperings of the ornamental grasses as they rustle gently in the wind and the fluttering of bird wings as they flit around in the shrubs foraging for seeds and berries. The birds are hungry this time of year. We always set up several bird feeders on our deck and keep them filled throughout the fall and winter. Mostly we fill the feeders with black oil sunflower seeds but we also have a thistle seed feeder for the finches and suet feeders for the nuthatches, woodpeckers, and wrens. The birds are thirsty, too! 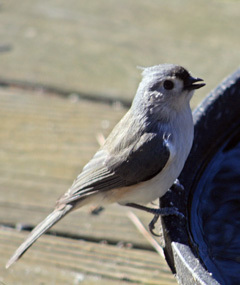 I am always amazed by the number of birds and other critters that make use of the big water bowl we have set up on the deck. We actually keep it filled all year long, but winter is a really important time to provide fresh water for the birds, as it can be difficult for them to find a source of open water – especially in the coldest areas of the country. 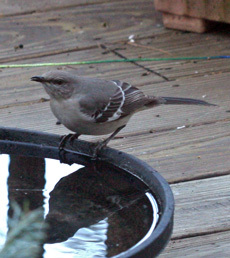 At times there have been so many birds perched on the rim of our water bowl that there is hardly room for one more! This morning there were chickadees, tufted titmice, goldfinches, a Carolina wren, and a newcomer, a hermit thrush, sipping water from the bowl. 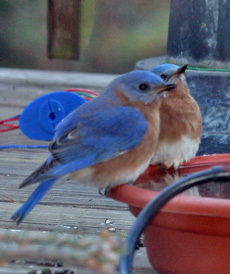 The bluebirds usually show up a little later in the winter. I’m convinced that this is why we get such a wide diversity of birds at our feeders. It’s not only the food but the water that brings them in. 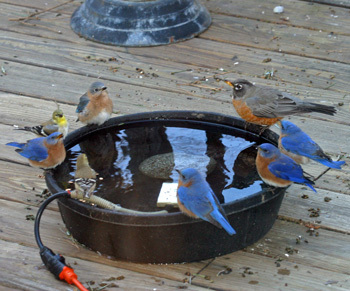 In fact, the bluebirds and so far the thrush never even go to the feeders – they just seem to come for the water. If we didn’t have this water source, I don’t believe we would see the bluebirds, thrushes, or even the robins on the deck. 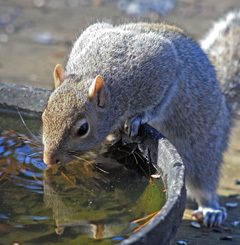 The gray squirrels enjoy the water, too. We don’t like to encourage them to come up on the deck but there’s no keeping them away. The squirrel-proof feeders we got from my mom do quite well at keeping them out of the feeders but they seem to find enough seed that the birds have kicked out onto the deck to keep them satisfied. 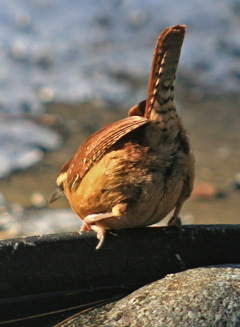 There are many ways to keep fresh water available to your birds. One of the simplest is what we have done for our birds. We got a big rubber water dish and placed a bird bath de-icer in it to keep the water from freezing. It works really well and the bowl holds a lot of water. Eric put a smooth rock on top of the de-icer to keep it in place and this provides another place for the birds to perch and drink. 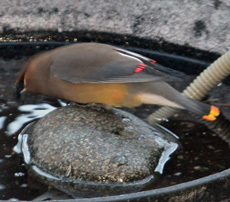 Another option is a heated bird bath. Different models are available; you can get one that mounts on a deck railing, one that sits in a stand, or one that sits on the ground. 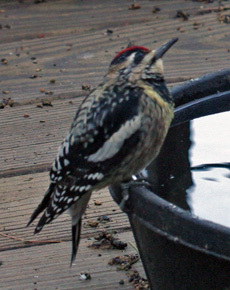 The heated bird baths are usually shallower than our big water bowl so they must be checked and refilled more often. dish that we used to use. 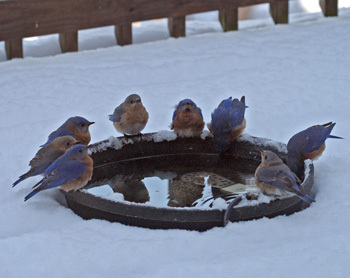 A bird supply store is a great place to find bird bath de-icers and heated bird baths. They usually have a selection of different options. You can sometimes find these items at a full service garden center as well. They can be a little expensive but if you really want to increase the diversity and numbers of wild birds around your home, it’s well worth the investment. We so enjoy sitting and watching the birds on winter mornings. This would make a great Christmas present for the gardener or birder on your shopping list! Happy Birding and Happy Holidays to all! This year, we spent Thanksgiving in beautiful Vermont with friends and family – what could be better! We even had a little snow and nice crisp, cold weather. Perfect! 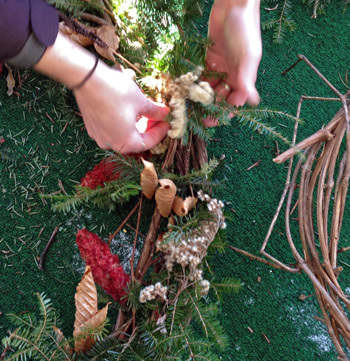 On the Friday after Thanksgiving, the kids (well they aren’t kids anymore) went for a walk through the woods in search of interesting greens, seed pods, dried flowers, berries, and anything else that they could use to create some wreaths for holiday decorations. I wish I had been around to go with them. They had a great time and came back with a really neat collection of plant material that they found throughout the fields and woods. When I got home, their gatherings were all spread out on the floor of the screened porch and they were in the midst of creating some beautiful wreaths. Busy at work surrounded by their collection of cuttings. 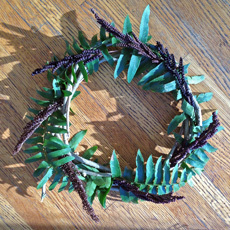 Mitchell made grapevine wreath forms while Melissa and Mitchell’s friend, Diantha, embellished them with the greens and other colorful things they had clipped on their walk. They did it all without wire, glue, or any other “man-made” stuff; just shears and lots of imagination. 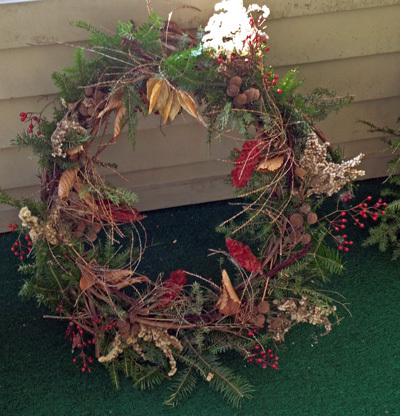 These beautiful wreaths were truly “all natural”. They simply wove and tucked! 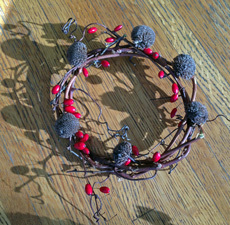 Mitchell wound the lengths of grapevine into various sized wreath forms; 2 large ones and 2 little ones. You can make the form any size you like and after you wind it to the thickness that you want, simply cut grapevine and tuck the end in. Once that’s accomplished, it’s just a matter of choosing what to decorate it with. Take a walk through your gardens, through the fields, and through the woods. You’ll be surprised at all the interesting things you can gather to decorate with. 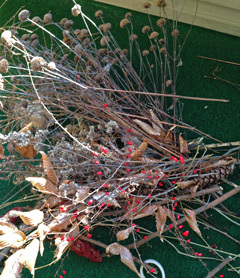 The dried flower heads of coneflowers, Rudbeckia and Monarda make great wreath decorations. 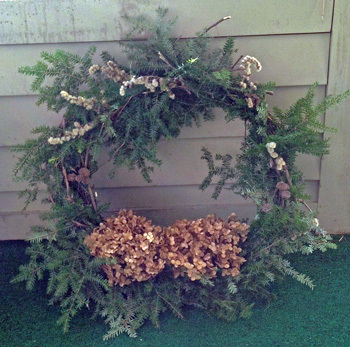 Dried hydrangea flowers and wildflowers like goldenrod, milkweed, and teasel will add fullness to your grapevine wreath. For bright color, tuck in some clusters of winterberry twigs with their bright red berries or branches of purple Callicarpa (beautyberry) berries. There is no end to the interesting “ornaments” that Mother Nature provides. 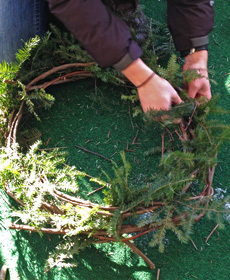 Try making your own natural wreaths this holiday season. 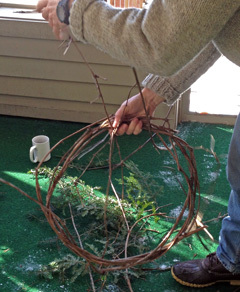 It’s a fun family craft project for a beautiful winter weekend!